I am in Olympia for the 2014 legislative session. A number of bills I am working on for the 13th District have had public hearings and are moving through the legislative process. This update provides an overview of that legislation and other issues and concerns before us this session. Rural county tax incentives: I introduced legislation that would help the economies of small counties across the state. House Bill 2204 would reestablish the Rural County Sales and Use Tax Deferral Program – a program that proved very successful from 1994 to 2009. We had economic development officials and representatives from Moses Lake BMW SGL, Chemi-Con and the Kittitas County Chamber come testify in support of the legislation. Read the press release here. Accessing public lands: I am working with Democrats on House Bill 2273 to ensure citizens will still be able to access public lands, even though state agencies continue to buy up large tracts of land. There is nothing more frustrating than finding state agencies blocking lands we have accessed for decades to go fishing, camping or horseback riding. This bill had a hearing this week in the House Environment Committee. House Bill 2255 is referred to as the Milwaukee Road Corridor legislation. It is an old railroad path turned into a trail, but because it was the first of its kind managed by the state it is operating under different rules than most rail trails. My bill simply gets rid of the arcane statutes and lets the Parks and Recreation Commission manage the Milwaukee Trail as it does all rail trails under its jurisdiction. This measure would also be helpful to farmers in the region to access different parts of their fields from along the corridor. Addressing Obamacare glitches: I have sponsored two bills House Bill 2220 and House Bill 2221 that would simply allow people to keep their own plans or expand opportunities to purchase other plans. President Obama told us we would be able to keep our own plans if we so choose. You can read more about the legislation in the Columbia Basin Herald article: Manweller bills designed to fix Obamacare glitches. Irrigation District Administration: House Bill 1417 would make some technical fixes to irrigation district law including administration, public hearings, reviewing delinquent assessments and authorizing hydroelectric generation facilities in certain circumstances. Transferring compostable waste: Many of you know I introduced this bill last June at the end of the third special session because a Spokane-based company was considering sites in Kittitas County to locate a composting facility to deal with Seattle's waste materials. House Bill 2072 had a public hearing in the House Environment Committee this week. 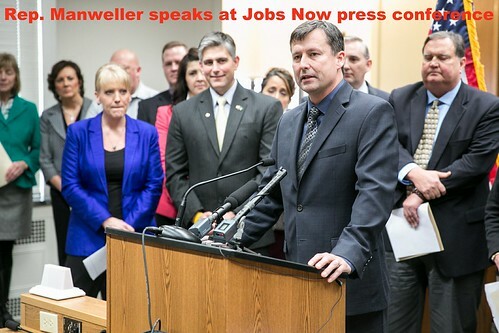 Jobs Now press conference: Republican legislators from the House and Senate who lead their caucus on jobs and economy issues held a joint press conference this week promoting legislation we believe would stimulate Washington's economy – bills from workers' compensation, regulatory reform, business tax reform to my rural county tax incentive legislation. You can watch the news conference here. Increases the tax on sales tax for trade-ins valued over $10,000. A family purchasing a $35,000 vehicle, and trading in a $15,000 vehicle, would see an increase on the sales tax paid of $450. Impose a tax on interstate transportation. We run the risk of starting a mini-trade war with retaliatory taxing from adjacent states and it could drive up prices for consumers. Impose a tax on recycled fuel used on-site in manufacturing. This tax exemption incentivizes recycling of fuel and the most efficient use, namely re-use at the same plant. Impose a sales tax on nonresidents. This will hurt job creation in border counties. Places the tax back on bottled water. This ignores the will of the voters. In 2010, the people passed I-1107, which repealed the sales tax on bottled water. Impose a sales tax on janitorial services. Another cost driver on our small employers. Increase the business tax on prescription drugs. This could drive up the costs of prescription drugs, harming those who use prescription the most – the elderly and the sick, who are also the least likely to afford an increase. The governor's proposed tax increases amount to approximately $400 million. He has also discussed income inequality and the shrinking middle class, yet these taxes will likely exacerbate the problem. Need I remind you, he also stated during his campaign that “no-new-taxes” were needed. Please do not hesitate to contact me if you have any questions or concerns about these issues or any other legislation before us this session. It is an honor and a privilege to serve the 13th District.